One of the surgical rooms on board (Marine Landing Craft) MLC Veivueti on May 31, 2018. The Government Shipping Services celebrated its recent investment, an $8 million multi-purpose vessel launched by Prime Minister Voreqe Bainimarama, last Thursday. The vessel is based at Government Shipping Services at Walu Bay in Suva. The vessel, Medical Landing Craft Veivueti, apart from providing medical services to maritime islands it will support people during disaster relief and humanitarian operations. 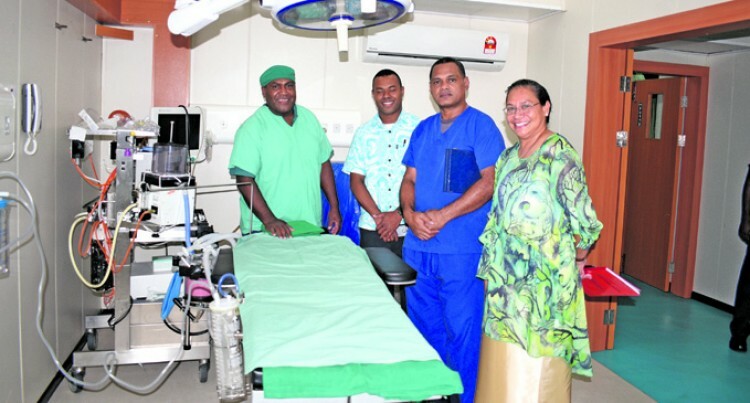 While commissioning the vessel, Mr Bainimarama said the medical vessel is equipped with state-of-the-art apparatuses like ventilator machines and medical lasers to treat serious eye complications. He said it is this duty of care that inspired her name; Veivueti in iTaukei means to help someone in a time of need. “The medical landing craft was specifically designed and built to provide both primary and secondary medical services and rapid response to emergencies,” he said. The 46 metre long vessel has the capacity of transporting 300 tonnes of water to drought stricken islands and can also cart a maximum of 200 tonnes of general cargo. He said the vessel can be quickly deployed to arrive and host an emergency procedure. “Veivueti will be unlike any resource we’ve had at our disposal here in Fiji. It will house separate rooms for operations, minor procedures, consultations, and recovery,” he said. “The vessel is specially equipped and designed to accommodate 18 crewmembers, including a full team of medical professionals who can carry out emergency surgeries, take x-rays, screen for pulmonary tuberculosis, perform urgent dental procedures, and more. “We already anticipate that the Veivueti will be in high demand all across Fiji. And as we are dealing with more frequent and stronger severe weather events due to climate change, we unfortunately expect the need for rapid maritime medical response to only rise,” he said. MLC Veivueti was built in Malaysia and will be looked after by the Ministry of Local Government, Housing and Environment, Infrastruc¬ture and Transport and Ministry of Health and Medical Services. “I would like to thank all those who were involved in making this project happen. From concept to delivery, watching the MLC Veivueti come to life and officially be put into commission was a process that required the hard work and collaboration of many different parties across different nations,” he said.